In response to the announcement by His Highness Sheikh Khalifa bin Zayed Al Nahyan, President of United Arab Emirates that the year 2017 is a year of giving, the students of the College of Mass Communication at Al Falah University launched a charity week which includes several charitable initiatives and volunteering offered by the students. 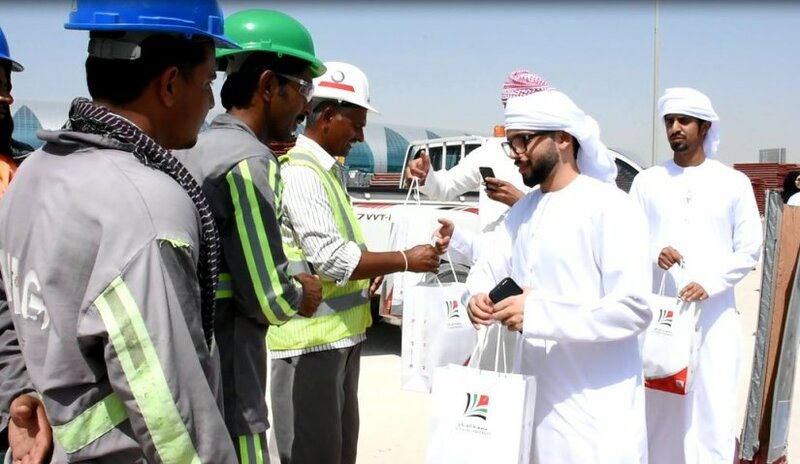 This week the students will distribute lunch to the workers in the expansion of the airport; will visit a number of centers of Al Hamam in the Emirate of Dubai and a number of hospitals to distribute gifts to children. Dr. Sameer Al Barghouthi, Vice President for Academic Affairs, said that such programs and projects are in line with the UAE's strategic and national initiatives, pointing out that these initiatives come under the general and comprehensive framework. Dr. Barghouthi added that the objectives of the campaign are to spread the culture of volunteering among students and members of the UAE community, support groups that need support and social care, and provide support services for the elderly, the sick and the needy. The Dean of the College of Mass Communication, Dr. Khaled Heneidi stressed that the philosophy of Al Falah University is based on community participation in the UAE. The students of the College were keen to organize the Year of Giving initiative through some activities that started with employees who participated in their efforts to expand and organize the streets within the city. The Charity Week is continuing to include other charitable aspects. The students of the College of Mass Communication stated that such initiatives need to be sustained in order to dedicate the UAE's approach as a way of life for its citizens; stressing those values such as giving and helping others are a characteristic of the UAE people.